The Magic Envelope ... or... The miraculous moneybox and the chandelier that did not fall... My annotated translation. So.... I first translated it into Swedish.... and had to explain lots of things to my husband and to my proofreader, who didn't know much about Phantom.... Just a translation of the newly discovered missing chapter from the book wasn't enough in their opinion. So I added an introduction, got my footnotes in order, etc etc and published "Fantomen på Operan - det magiska kuvertet" in Swedish... With some extra material and background reading. Wanting to "spread the joy" and to make the unique background material available to a wider audience, I have produced an English version... now available on Createspace https://www.createspace.com/4748749 and shortly on Amazon. Re: The Magic Envelope ... or... The miraculous moneybox and the chandelier that did not fall... My annotated translation. I just finished reading my copy! I enjoyed it and recommend it to all Phans. Eeep!! A reader! Someone actually bought my book!!! It was such fun to work on it, and my background research turned up some unexpected details. For example - I've always been sceptical about just one person dying in an accident with a falling chandelier, in Leroux's book. A stonking great big chandelier - how could that not kill more than one person??? Then I read the details in contemporary accounts of the accident at the Opéra Garnier/Paris Opera in 1896, when a counterweight to the copper disc above the chandelier fell down, and found that indeed only one person was killed even if several more were injured. All the same, a disc from a counterweight isn't the same as a WHOLE CHANDELIER!! Just as in Leroux's book, the real-life victim was a concierge. She lived in the Impasse Briaire, close to Rue Rochechouart. You are more than welcome! It has earned a permanent place on my Phantom shelf in my bookcase. I'll be revising this first edition shortly. I can post a list of the errors here, for information. My apologies about this. Anyone who has bought the book and found any of the mistakes, please feel free to post them here. It's been a humbling experience, to "put my money where my mouth is", ie to try to translate Leroux. In general I've often been quite critical of how others translate (not Leroux but other authors), but it is really hard. Especially with Leroux. He is so... quirky and special. It was also difficult to translate some of my own texts from English into Swedish - it was my own fiction, I am fluent in both languages, but.... the text in Swedish just isn't the same as in English. To clarify.... have been asked about the various theatre accidents, and have realized that I have mixed up the names in my book in two places. In 1896 at the Opéra Garnier aka the Paris Opera: a counterweight to the copper disc above the chandelier crashes through a flue and kills one woman, a concierge, who resides close to Rue Rochechouart. In 1888 at the Théâtre Lyrique: one of four chandeliers falls from the ceiling, killing one of the spectators in the stalls. He was the son of the owner of a chemist's in Rue Rochechouart. In 1887 at the Opéra Comique: a fire destroys the theatre, killing around a hundred spectators. It was a horrific accident, given extensive coverage in the newspapers of the time. Le Gaulois had it's offices just across the road from the theatre. 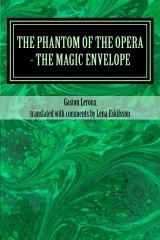 Am revising the first edition of the book, to correct various errors, am also re-editing one of the appendices, and will be adding an appendix about phantomoftheopera.com. Not everyone here may know this, but the Internet site phantomoftheopera.com was the oldest Phantom fan site in existence, up until this summer. It was set up (ETA: in the forum format we know today) in 2004 by Christine Daaé Clemens and Karin Willison, and disappeared in May 2014, after a period of technical problems. The rights to the domain name having expired, the domain was put up for auction, and Andrew Lloyd Webber's company RUG bought it in July 2014. The new appendix will briefly summarize these events, and include a list of the forums on the site, with their descriptions. As a document and epitaph over an iconic site that is missed by many. ETA: Karin Willison actually set up the site in 1999, but it evolved over the years, settling into the forum structure familiar to most of us, some time around 2004. Have corrected some typos and errors, adding a few credits, such as the licence granted by the BnF (oops, forgot to put that in first time around, ouch!). 2) have added an Appendix F, describing briefly the history of the fan site phantomoftheopera.com (as far as I have been able to reconstruct it from various sources) and its structure when it disappeared in June 2014.